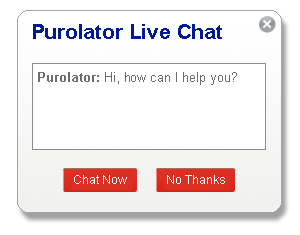 Save up to 65% by opening a new Purolator Business Account. * By opening an account online, you will automatically be registered for online shipping. International shipping resources for your business. Automated solutions that help simplify shipping. Contact us via e-mail, phone, Twitter or live chat. SHIP FROM: Please note that your address has been updated to match your new postal code. SHIP TO: Please note that your address has been updated to match your new postal code. For a more accurate estimate, enter details for each piece.